Seattleites now have a kind of free dating site for arborists and gardeners. 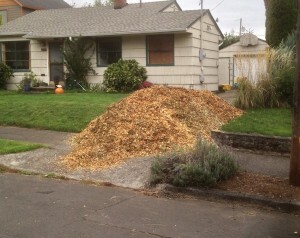 Portland businessman Bryan Kappa recently opened a Seattle branch of Chip Drop (http://www.chipdrop.in/), which connects arborists to homeowners who want free woodchip mulch. Homeowners put their addresses on a map, and arborists working nearby can drop their chips in any yard on the map. Founded only six months ago, Chip Drop doesn’t yet charge for the service, which is in 19 cities and is growing rapidly. Best of all, these chips are free. Many pricey mulches, such as bark and sawdust, actually cause problems for plants. Bark naturally has a waxy coating that repels water and creates a fire hazard. It is likely to introduce weed seeds (think horsetail), and because it is sometimes stored in saltwater, can emit toxic levels of salt into the soil. Sawdust is so fine that it is impenetrable to water. Of course, there’s a catch: Homeowners won’t know whether or when arborists will drop off chips and should expect 5 to 12 cubic yards. 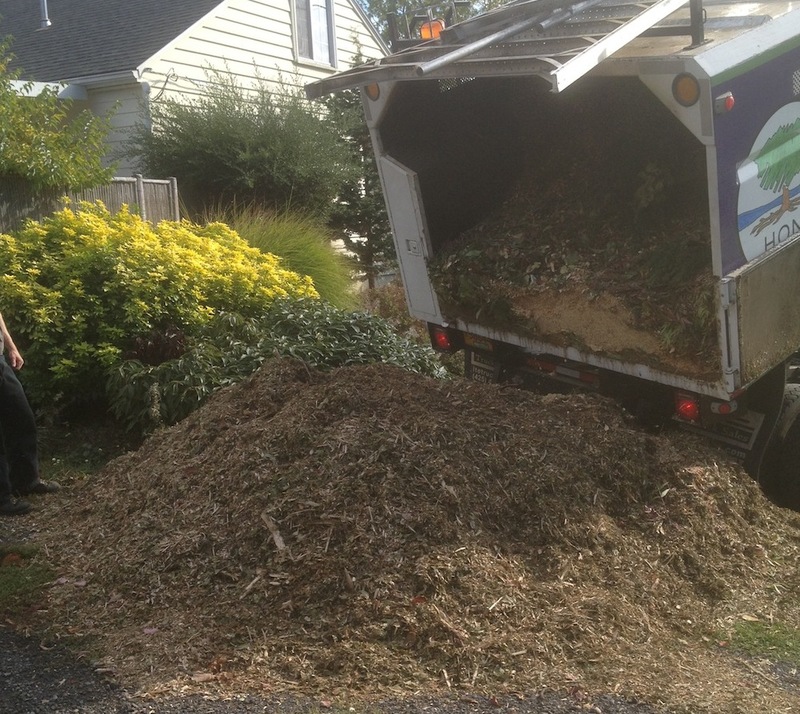 Twelve cubic yards is enough to cover 1,000 square feet with nearly 4 inches of mulch. Kappa suggests recipients share their bounty with neighbors through such forums as Craigslist, Facebook’s “Buy Nothing” pages, or a classic “Free mulch” sign stuck in the pile. Tip: To figure out how many cubic yards of wood chips you can use in your yard, check out Web sites such as the Landscape Calculator, or consult a 7th-grader, who knows that volume = length x width x depth. Another caveat is that you won’t know what you’re getting until you have way too much of it. Dull chipper blades make coarse or uneven chips, says Shoreline arborist Chuck Hinshaw, who owns 2nd Nature Arborist Services, Inc. If the arborist’s crew happens to be pulling ivy that day, you might be inheriting that, too. Seattle plant expert and arborist Arthur Lee Jacobson notes that the quality of the chips can make a huge difference in growing outcomes. Ultimately, though, Chip Drop can help close the sustainability loop. With many more options for where to drop chips, arborists can save the time and costs of driving gasaholic dumptrucks to distant composting sites and paying to unload. Homeowners are more likely to get a free pile of mulch—and meet their mulch-minded neighbors when they share the pile. Arborists and Gardeners can register for Chip Drop at http://www.chipdrop.in. You can get hold of arborist Chuck Hinshaw at 206 365-2442. Arborist and plant expert Arthur Lee Jacobson is accessible through http://www.arthurleej.com/ or (206) 328-8733. To contact Washington Tree Experts, go to http://www.washingtontreeexperts.net/ or call (206) 362-3380. Disclosures: Note that as far as I know, everything in this brief article is objectively true, but it does not qualify as classic, ostensibly unbiased journalism. After I wrote the bulk of this story, Washington Tree Experts dropped off a lovely load of arborist chips at my house. Arthur Lee Jacobson and Chuck Hinshaw are friends. Linda Chalker-Scott is my colleague and former school advisor. All photos are shamelessly swiped from http://www.chipdrop.in/. I think this is a great service HOWEVER….. Looking at the photo of wood chips all over a public sidewalk gives me pause. You’d need to get out there lickety split. Well done with the post. I just may take advantage of this. great article, Cindy. Thanks for the refresher/update on what’s good and not-so-good for mulch. Are these wood chips or mulch? I am looking to cover a section of backyard with wood chips that can handle foot traffic. Just an FYI. You may have to wait. I live in Upper Rainier Beach and some in my area have waited a month or more. I’ve been waiting for about 10 days and am not hopeful. I put out a tarp and sawhorses to designate the spot and some of the neighbors are getting unhappy. I have waited all year to get wood chips this year. Somehow about 2 1/2 months ago I learned my name was not on the list, so I added it again. I am still waiting. The service has changed and with the encouragement of providing $20 or whatever for a delivery fee, this company is taking away the free aspect. So I do not think Chipdrip.in has done a service to consumers. The arborist would have to pay to dump the chips, now he can get paid to drop them in your driveway. I would just encourage people not to pay as we are doing the arborist a favor by taking the chips for him, and we never kniw the quality. Say: Can anybody tell me the current status of this service? Is it being charged for now, or any free options anyone knows of for chips? Thanks! Would love some wood chips for my garden. Please give at least one day’s advance notice–need to move the car out of the driveway. @Cath – Please visit the service’s web site to sign up. This is a neighborhood blog and we’re just letting people know about it. They don’t read and respond to our blog. The Chip Drop website does not appear in its entirety on the computer screen. It is impossible to sign up. There is no contact information.